Cranes are a vital part of many building, mining and construction site and it’s essential that these are moved from site to site efficiently and with minimal disruption. As cranes are heavy pieces of machinery and equipment, it’s important to find a transport company that is highly experienced and has the right truck or trailer to haul your heavy load. Whether you need a rough terrain, mobile crane or Franna crane shifted from one construction or mining site to another, then you will need to find a reliable and professional transporter to perform the job for you. Get quotes for transporting cranes today! Get 3 Quotes for transporting cranes. It’s free to request quotes. Mobile Crane: A crane truck or mobile crane can be driven onto a tilt tray to load the crane for transport. For transport, the mobile crane can be driven onto the flat bed tilt tray, so the logistics of loading and unloading this type of crane is a fairly simple process. These mobile cranes are often moved in metropolitan areas and interstate because they are unregistered, unroadworthy or sometimes even due to break downs. Crawler Crane: A crawler crane can’t be driven on the road due to the tracks this heavy machinery moves on. As a result, there is a regular need to have crawler cranes transported to construction and mining sites all across Australia and throughout each state. Crawler cranes can be extremely heavy pieces of machinery and so finding an experienced and professional transport company to shift your load is essential. Franna Crane: A ‘pick and carry’ crane or a Franna crane is a mobile crane and, therefore, can be moved from site to site on public roads. Often these cranes require additional assistance to relocate to another location and the services of a transport company are then required. The fact that the Franna crane is driveable means that it is easier to load onto the back of a tilt tray semi-trailer and can then be secured to the flat bed during transit. All Terrain Crane: These cranes are heavy duty cranes and are ideal for all conditions. This makes them perfect for use in mining sites and large construction sites all across Australia. All terrain cranes can be driven onto a tilt tray truck or trailer which makes for relatively simple loading and unloading. It’s important to find the right transporter to get these all terrain cranes to the required site safely. Rough Terrain Crane: A rough terrain crane is mounted on an under carriage and this allows for straightforward loading and unloading when it comes time to transport these cranes. Although relocated around the mining or construction site due to the crane being mobile, a rough terrain crane is sometimes unable to be driven on the roads. This creates a need to find a reliable transporter with the right vehicle and equipment to haul this heavy load. Tractor Crane: If you have a tractor crane to transport to a construction site or farm then you will not be able to drive this machinery on the roads. In this instance, you will require a transporter to shift your load and that driver will need to have a flat bed truck or trailer to move the freight for you. As the tractor crane is drivable, it can still be loaded with a tilt tray truck or trailer which allows for relatively smooth unloading and loading of the crane. Straddle Crane: A straddle crane is a large crane with a different purpose than most cranes listed here. Straddle cranes or straddle carriers are primarily used to lift, relocate and move shipping containers and extremely large and bulky civil engineering and mining materials. These are usually driveable or will come equipped with wheels which creates a less challenging load and unload process than a stationary crane. 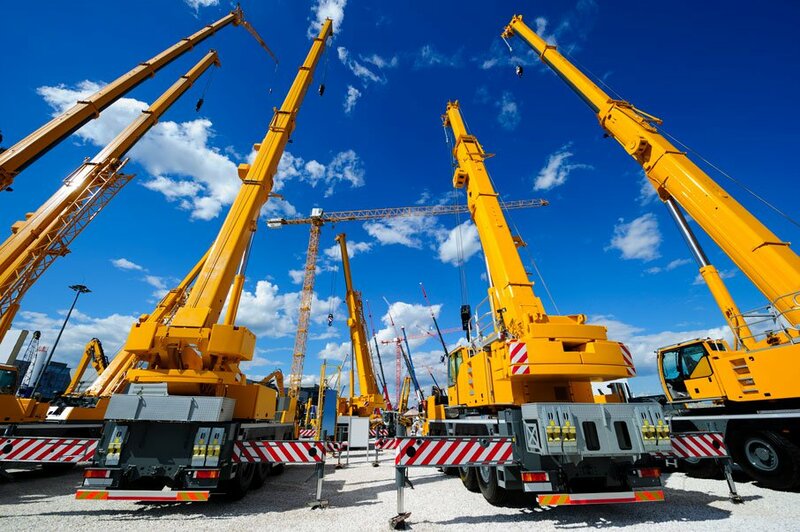 Overhead Cranes: If you are looking to move an overhead crane, then you’ll need to find a transport company who has experience with relocating large and bulky heavy equipment. As the overhead crane is stationary, it creates bigger logistical challenges than most mobile or driveable cranes do. There are transport companies that specialise in heavy equipment relocation and have the correct vehicle and equipment to move this type of freight. Tower Crane: When a tower crane is relocated generally the tower mast and jib are separated so that they can be stacked onto the back of a flatbed truck or trailer and secured to the trailer. As they can’t be wheeled by their own means for loading and unloading for transport, the tower crane jib and mast may be loaded with a large forklift, excavator or a crane. If you’re looking to have a tractor crane, crane truck or even a tower crane relocated for mining or construction, then you need to find a dependable, experienced truckie who has the right truck or trailer to take on your freight. FreightQuotes allows you to connect with transport companies who are able to take on your kind of crane freight. Simply complete the free quote request form on our website and this request is then sent to all the transport companies registered with the FreightQuotes website. From there, up to three of our transporters will then contact you directly with quotes to move your crane anywhere across Australia, interstate, regionally or within metropolitan areas. Simple, free and convenient. Crane transport is available Australia wide. This includes interstate, regional and metropolitan freight covering all states and capital cities including Adelaide, Brisbane, Perth, Darwin, Melbourne, Canberra, Hobart and Sydney.